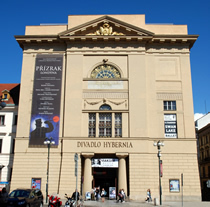 Hybernia Theatre in Prague presents a varied programme of ballet, classical concerts and theatre performances. Hybernia is situated on Republic Square (Náměstí Republiky), opposite Municipal House, and is a few minutes walk from both the Old Town Square and Wenceslas Square. Hybernia Theatre opened in 2006 to much acclaim, following a major reconstruction project that transformed a former art gallery and customs house, into a modern air-conditioned theatre with fine acoustics. Hybernia is a smaller theatre than many, and more recently designed, so there are good views of the stage from all seating areas. Facilities include easily accessible toilets spread around the building, a cloakroom and several bars which serve reasonably priced drinks before, during and after performances. Hybernia Theatre stands on the site of a former Benedictine church. The property was given to Irish Franciscans who were expelled from their country by Queen Elizabeth I in 1630. The Latin word for Ireland is Hybernia, from where the theatre gains its name. For listings and to book tickets for Hybernia: Prague concerts & ballet.